Washington, January 28 (KMS): American Sikhs held an anti-India demonstration in the US Capital, Washington DC. The demonstration was organized by a pro-Khalistan group, Sikhs for Justice, in front of the Indian embassy building in Washington DC on India’s Republic Day, the 26th January. 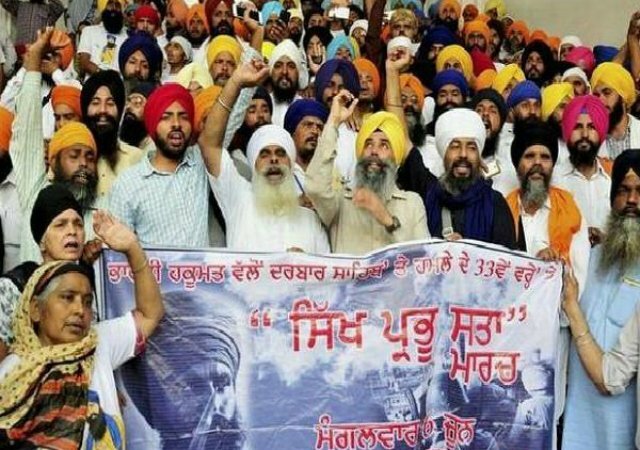 The protesters set Indian flag on fire and raised “Khalistan Zindabaad” slogans. The burning down of the flag happened almost at the same time when the Indian ambassador to the US hoisted it at the Indian embassy in Washington DC. It was a tense time for the local law enforcement officials as the Indian-Americans and Sikh protesters were standing face-to-face in a park just across the road from the Indian embassy in Washington. The standoff lasted for about two hours after which the local police forced the protesters to move across the road.